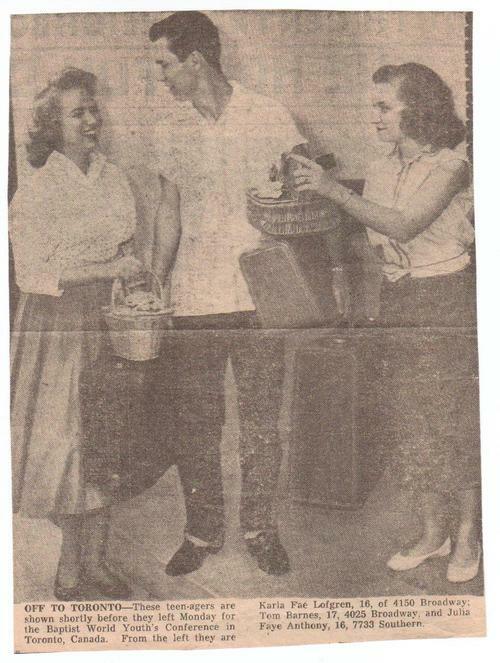 The caption under this Houston Chronicle newspaper article reads..."OFF TO TORONTO...these teenagers are shown shortly before they left Monday for the Baptist World Youth Alliance in Toronto, Canada. From left to right they are Karla Lofgren, 16, of 4150 Broadway; Tom Barnes, 17, of 4025 Broadway; and Julia Faye Anthony, 16, of 7733 Southern. Tommy and Julia Faye were from the class of '59. There were about 50 of us (including those dratted chaperones) from Park Place Baptist Church on a deluxe charter bus - traveling across country, set free on the big city of Toronto, staying in a residence type hotel. We also went to Niagara Falls and donned the yellow slickers for the climb down the wooden staircase to the lower section of the falls. Wet, but awesome! Which of you blog readers were on that bus to Toronto with us??? What are your memories of the trip??? Did any of you go to the Baptist World Youth Alliance with another group or with your family by car??? Girls - remember those basket purses with the lids that hinged and lifted and the flowers on top? And that Samsonite luggage is now sold in vintage shops for a hefty price - a popular item for home decorators. Who'd a'thunk-it?? ?